Impala Tech > Impala Tech > Interiors > Has anyone installed aftermarket seats? Has anyone installed aftermarket seats in their car? I would appreciate any ideas and suggestion anyone might have gained from their experiences. 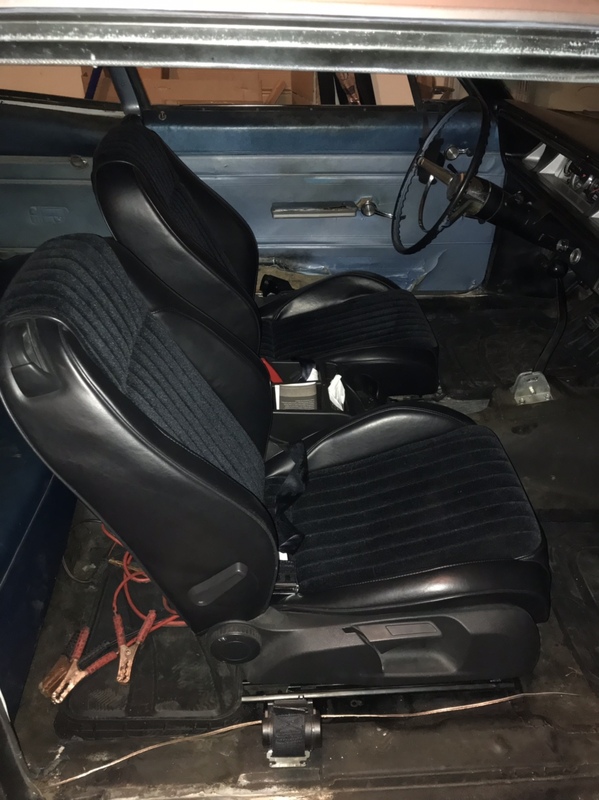 I have installed leather seats out of a Dodge Charger SE in a Chevy II, and a bunch of fiberglass and aluminum aftermarket seats (bare; not even padded) in Novas and Camaros. In every case I had to fabricate seat mounts to install the seats as none of them dropped in place on the floor pan. Thanks Dave. Luckily I am not in a hurry so I have time to test ride many different models. I expected the fabrication mounting part. I recently had modern seats installed in my 66 Biscayne. The seats are out of a late model VW Golf GTI. The guy I bought them from had already had them recovered with intentions of installing them in his old Ford I believe. These seats are very comfortable and are fully adjustable manually with no need to wire anything up. The bolstering is fairly substantial and seem to hold me in place well. Of course I’ve only driven the car twice since installing them as the motor is being taken out for my LS swap. I ordered the factory bucket seat brackets as my car had the bench originally but then shop doing the install couldn’t use them as they didn’t work well with the seats and factory floor together. They ended up making custom mounts for them. This isn’t the greatest pic but you get a good idea of them in the car. It definitely makes the interior look huge now as opposed to the old bench. It's a pair of Corbeau seats and a 5th gen Camaro console. The hardest part of the whole project was converting the parking brake assembly. I cut out the original bucket seat humps and made new mounting points to match the universal Corbeau rails. Those seats look good. How do you like the Camaro console? I’m thinking of options for my car. The Camaro console took some work and planning since I wanted to retain the parking brake instead of using the original foot brake. Also, I set it up higher than the OE console to actually function as an arm rest. Details are on the link in my sig.